Brand new with tags and absolutely perfect! NWT BOYS TODDLER DISNEY Pixar LIGHTNING McQUEEN 2 Pc Set Top Joggers Size 2T New. Condition is New with tags. Shipped with USPS First Class Package. SIZES IS BABY SIZES 12 MONTHS TO 24 MONTHS. 100% COTTON. TANK TOP WITH SHORTS. STYLE: 303P. 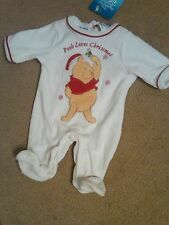 NWT INFANT GIRLS DISNEY WINNIE THE POOH CREEPER OUTFIT FOR CHRISTMAS. FOOTED FOR WARMTH. HAS LARGE POOH ON THE FRONT. SIZE 0-3 MONTHS. It is solid white with four stripe bands that go all around the upper part of the shirt front and back with a small picture of Winnie the Pooh on the front as shown in the pictures. The stripe colors are dark blue, olive green and light green and a tan color. The shorts and navy, orange, yellow, and light blue plaid. They are elastic waist pull on. The t-shirt has Winnie The Poo on it. Bounce With Tigger. The sleeves are short with navy blue stitching. Lot of 4 pieces sizes 0-6 month 1 Winnie the pooh shirt, 1 bodysuit, and 2 pair of pants. All in good lightly worn condition, no holes or stains. 12 m Disney Mickey onsie Shorts Set. 12m boys mickey onsie short. Bought new at Disney. Very unique jumper - one piece. This looks so cute on, why do they have to grow so quick. Check out all our cleaning out of Disney closet to get ready for the next year. Includes a long sleeve shirt and candy cane striped pants. Snug fitting. Disney Boys Mickey & Pluto Naughty or Nice 2pc. Knit Sleepwear Pajama Set. 2-Piece pajama set.